One of the things that has become popular with both large and small businesses these days are electronic message boards. Technology has made it possible for businesses and individuals to broadcast messages almost instantly through digital means, which has very positive connotations if used responsibly. The fact that they can be controlled by computer makes it even easier, and even helps to inspire more creativity when it comes to messages. 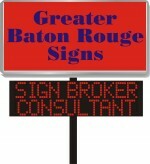 If you have a large or small business outside of your home, then you might want to consider electronic message boards. This doesn’t necessarily mean that the board would have to be located outside; that would depend on what you want to use it for. A strategically placed outside digital sign could constantly inform the public of what you have on sale, for instance, if you are running something like a bakery or clothing business. If you prefer being more subtle, an inside digital sign can keep customers apprised of the benefits that you have to offer them while they’re shopping, such as discounts for seniors or a clearance section in your store. These signs catch people’s eyes, and it’s up to you to decide where you want to get their attention. Where does one find electronic message boards? Most sign companies have joined the digital bandwagon and offer this technology now, and for good reason. If they didn’t, they would risk being left behind. You can also find them at places such as restaurant supply stores, some office supply stores, and most major electronic stores. The bottom line here is to look for competition. Don’t automatically assume that the price on the first digital sign that interests you is representative of the prices for it everywhere. One great way to comparison shop is to do so online. Almost all businesses have their own websites now, and there are also sites dedicated to finding the best deals on many different products. When you’ve done your shopping and have found and bought the electronic board that you want, your next step is learning how to use it effectively. Like with most new “toys”, it’s tempting to play with it a bit. That’s fine, as long as you don’t go overboard. Without actually exposing it to the public yet, go ahead and get used to how it works, and how you can manipulate it. Be sure to set guidelines for yourself and/or your employees before actually putting it into play, though. This is about enhancing your business, and you want to always keep your image in mind. There is no doubt that electronic message boards can be a real boost to your business. They can advertise your benefits, and they save you money and make you money at the same time. Be Aware!! Baton Rouge enforcing section of the sign ordinance involving Banners!! If you follow the above language you DO NOT need a permit. If you want to display Banners outside the above language YOU WILL need a permit and there are perimeters in their use. One of my Clients receiving a Citation Letter in the mail along with a fine for $117.00 – thought you should know. It is my opinion that the city is finding a large amount of abuses with Banners and that is why they are doing this. If you need to purchase a new banner to avoid citations, call us at (225) 937-3643.